Experience this private oceanfront home tucked away in Heeia Bay, on the sun-kissed southwest shores of the Big Island of Hawaii. 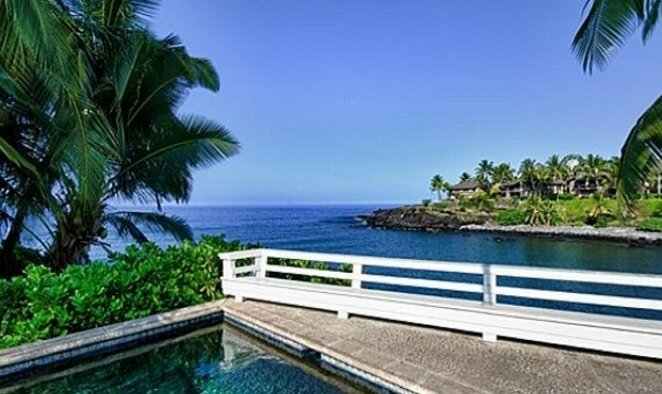 This classic Hawaiiana residence is situated above the ocean’s edge next to a beautiful lava rock bluff, offering a spectacular view of the Kona Coast. The property is self-contained with a large great room, perfect for entertaining, connected to a well-stocked kitchen and expansive enclosed lanai, overlooking the bay and naturally heated black bottom pool. The home features 4 bedrooms and 5 and a half bathrooms. The main house includes the upstairs master bedroom with king sized bed, Jacuzzi soaking tub, walk-in shower and wrap around porch. The three guest suites are located in an attached guest wing, each with their own bathrooms, TVs, ceiling fans, and access to the enclosed inner courtyard and pool. In the mood for snorkeling? Follow a paved pathway for beach access to the Bay, just around the corner off Manukai Street. Looking for dining, movies, souvenirs, or even a Farmer’s Market on Saturdays? The Keahou shopping center is just up the street. 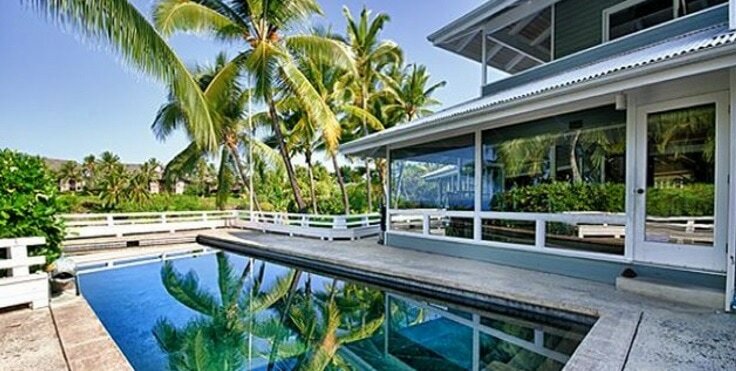 Located just 6 miles south of downtown Kailua-Kona, this house is a convenient “home away from home” when visiting the Big Island. Head down the street to Keahou Bay for easy ocean access, scuba diving trips, sailing, catamaran, fishing charters, sea kayaking, manta ray night diving and outrigger canoeing. If you are seeking local markets, shopping, and art galleries, downtown Kailua-Kona is approximately a 10 minute drive. If you are more of a homebody, this location is perfect. There is a gas BBQ on the back deck ready to grill up the fresh catch of the day and lots of comfortable seating to lounge around and watch the stunning island sunsets. For the more adventurous, there is hiking on the volcanic trails, water fall trails in the east near Hilo, horseback riding in the northern Waipi'o Valley, and star-gazing atop Mauna Kea! Please Note: This property might not be suitable for small children due to the pool and cliff location as well as the location of the bedrooms.